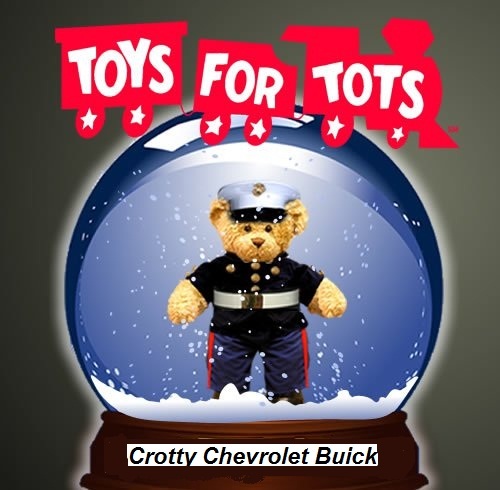 Crotty Chevrolet Buick is proud to be partnering with Toys for Tots, to bring holiday cheer to Corry, Erie, Warren and Jamestown, NY underprivileged children. To help make the holidays a little brighter for needy Corry, Erie, Warren and Jamestown, NY children, residents can drop off new, unwrapped toys in the 2013 Chevrolet Equinox located in the showroom at Crotty Chevrolet Buick anytime between now and December 15th. Each donation goes directly to the local branch of the Toys for Tots program which distributes the toys to the less fortunate children of the area. For the 2nd year in a row, Crotty Chevrolet Buick is bringing back the successful Chevy’s Giving More calendar year-end event to help build holiday a spirit of good cheer within Corry, Erie, Warren and Jamestown, NY. The Chevy’s Giving More event not only means giving more savings or value to customers, but will also giving more to the local Northwestern PA community. During this holiday season, Crotty Chevrolet Buick has teamed up with Toys-for-Tots to give back to the community as well as to customers. This year’s Chevy’s Giving More is bigger and better than ever. Customers can find finance and lease offers on new vehicles, including the Chevrolet Silverado, 2013 Chevrolet Malibu and the entire 2013 lineup of Chevrolet cars and crossovers. “The Chevy Giving More event is a great time to buy – whether it is to reward yourself, your business or those you care about most,” said Robert Crotty. Customers can take advantage of Chevy’s Giving More from November 13, 2012 through January 2, 2013. Breast cancer survivors and their guests will take turns riding around the Atlanta Motor Speedway track Friday in this specially themed pink Chevrolet Camaro SS Pace Car driven by Team Chevy’s Jamie McMurray and Ron Hornaday, Jr. On Sunday, Chevrolet will donate $200 for every caution lap the Camaro SS paces in the NASCAR Sprint Cup Series AdvoCare 500. Last year, 64 caution laps generated $12,800 for the American Cancer Society. Chevrolet Racing will renew the brand’s fight against breast cancer this weekend at Atlanta Motor Speedway where every lap run under the caution flag will lead to a $200 contribution by Chevrolet to the American Cancer Society’s Making Strides Against Breast Cancer initiative. On Friday, 30 breast cancer survivors and their guests will spend the day at Atlanta Motor Speedway and participate in Chevrolet Camaro SS pace car rides around the historic track with Team Chevy NASCAR Sprint Cup Series driver Jamie McMurray and four-time NASCAR Camping World Truck Series Champion Ron Hornaday Jr. NASCAR Nationwide Series driver Danica Patrick also will visit with survivors for photos and autographs. On Sunday, Chevy will donate $200 for every caution lap run during the NASCAR Sprint Cup Series AdvoCare 500, paced by the pink Camaro SS featuring the Making Strides Against Breast Cancer logo. 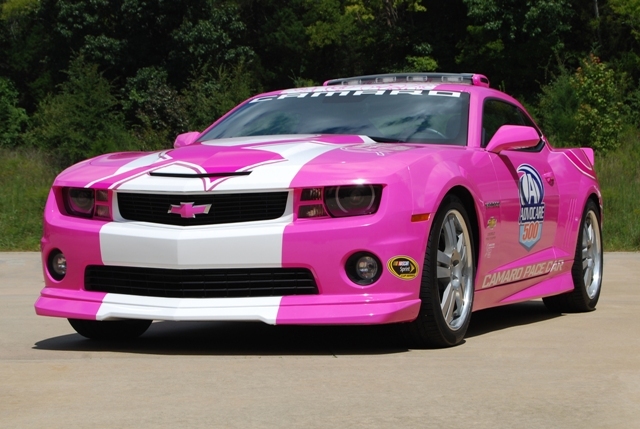 In 2011, 64 caution laps at Atlanta generated $12,800 for the American Cancer Society.